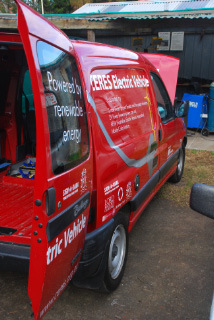 The CERES electric car project is a community-based volunteer initiative at CERES Community Environment Park in East Brunswick, Melbourne, Australia that has recently converted a Citroen Berlingo from a petrol powered motor to an electric motor, paving the way for more environmentally sustainable transport in the future. Funding was generously provided by the Lord Mayor’s Fund & Donkey Wheel. Highly trained volunteers from the CERES transport Group provided labour for the project. The Victorian Minister for the Environment, Climate Change and Innovation, Gavin Jennings launched the car on Thursday June 5, 2008 which was World Environment Day. If the electric power was generated by green power then this car has zero carbon-emissions. The project has demonstrated it is possible to convert an existing mass-produced car from a greenhouse gas emitting petrol driven car into a carbon free electric one. Simple engine design with few moving parts that don’t require the servicing that a combustion engine requires. Easy maintenance. The only work required on the car is electrical system checks and tyre rotation. No need for oil changes & filters, fuel tanks, fuel injectors, carburettors, or an exhaust system. No need for replacing spark plugs, engine oil, oil filters, air filters & timing belts. No need for emissions tests. Cars can be ‘recharged’ during the braking process (known as regenerative braking). No energy is consumed when the car is stationary at lights, the motor does not run at all. 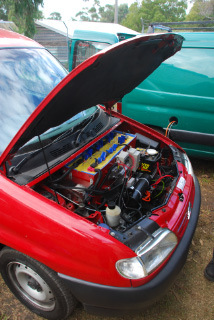 Electric motors are probably the most efficient systems for propelling cars. Even when the electricity is derived from coal fired power an electric car has 30% less emissions than a petrol powered one. This page was last modified 22:49, 9 December 2008.